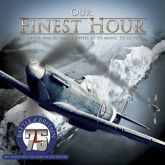 With this DVD and CD collection, you can relive the sights and sounds of a nation at war. In the summer of 1940, Britain stood alone against the Nazi menace, threatened by invasion yet galvanized by the bulldog spirit of Winston Churchill. Recall those epic times through the newsreels, broadcasts and music from 1940 and beyond.